Also see Asian Banjo	Catalogs. Vintage Gold Star - Richard Keldsen of music wholesaler Saga in So. 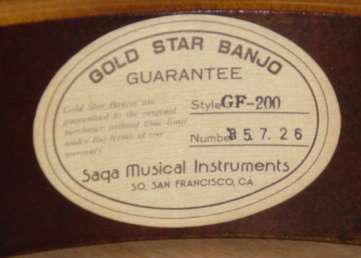 San Francisco, CA, was responsible for the excellent Gold Star banjos, as well as the Kentucky and Saga Mastertone style banjos, 1976-86. Richard has an original RB75 from which dimensional data and the tone ring formula for the 1978-86 flathead banjos were taken. These banjos have the prewar form factor tone ring with the longer skirt than current USA practice. The tone rings were made at the Takeuchi metal works factory, with the possible exception of some JDC's. Gold Star flathead and 40 hole archtop rings are the same shape as the prewar Gibson rings, which the entire current crop of flathead tone rings (with the notable exceptions of JL Stull #4 and #12, rings supplied in Huber banjos, Woodhill Bell and Burlile) are not. The current rings have a slightly shorter (about 1/16") skirt. This includes McPeake, Huber (rings for the aftermarket, not in Huber banjos), T20, FQMS, Kulesh, Liberty, Bucks County, StewMac/Ryan, N. Georgia Music, etc. If you put a JLS ring on a regular height pot, including Asian banjo pots, you get the fit with the free inner lip. See the Tone Bell® write up at Bill Palmer's site. 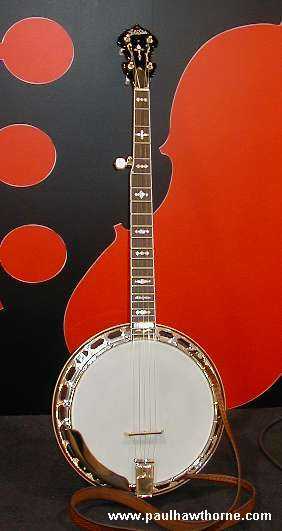 The banjos were made by various vendors in Japan over the 8-10 year span. I understand the first ones (76xxx) were made by world class mandolin luthier Sumi. Main production following that up until about late '81 was at the Tokai factory, then difficulties caused an abrupt stoppage of production for about a year+. 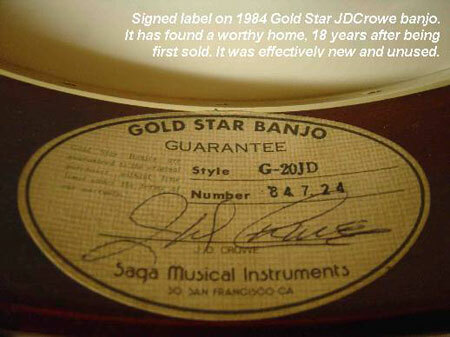 This is why banjos with serial numbers reflecting '82 or '83 very rare. Late production was by a small maker (1 or 2 men) with the same metal parts as the Tokai production, since these parts were from a separate vendor. A small production also happened at the Kentucky brand mandolin factory (in Japan) which I believe was owned by Keldsen by then. Late production is identified by serial numbers indicating 1983 or later. There were a very few top tension models also, the preponderance are regular Mastertone replicas. FURTHER: NONE OF THIS INFO IS DEEMED 100% accurate, being partly assembled from best guesses. And anyone who is living in the delusion that they will ever get the true, full Gold star history here or ANYWHERE is sadly mistaken. The only real source is Richard Keldsen, and he has specifically declined to expound for the public on numerous occasions. Serial numbers: I believe the serial numbers reflect the approximate date wholesaled by Saga USA. 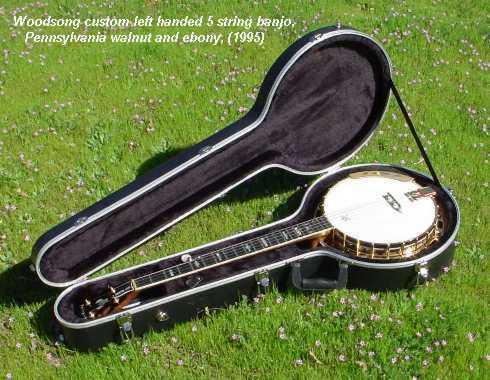 It seems the banjos were built in batches, and then numbered in the USA as they were sold. 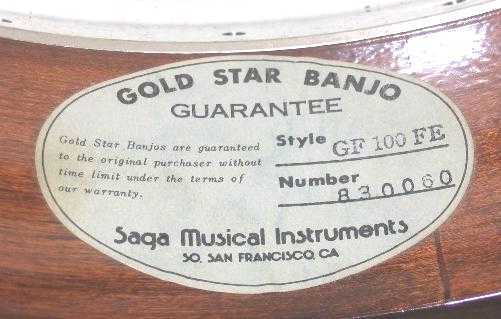 The last batches of Gold Stars all seem to have been made about 1984, but bear serial numbers 84xxxx, 85xxxx, and even 86xxxx including at least one JDC that went through Mandolin Bros. The first digits reflect the year labeled, the following 3 or 4 are in some kind of a sequence I have not figured out yet. The shifting value of the yen and the improved quality of Gibsons made the market for Gold Stars shrink dramatically by 1986, and Saga ceased to offer them. 82xxxx or 83xxxx serial numbers are very rare in GS flatheads, but they do exist: 1982, 1983. Archtops were the main line at that time, due to the cessation of production at Tokai mentioned above. Model number code: GF-100-HF, 4 pieces of information to the format below. 11 - 40 hole archtop, mahogany, two piece flange. Came in wreath, flying eagles (aka splattered frog, splattered bug, or Reno) and h&f, 2 w/b/w concentric rings on the resonator. I have seen and played a very early ex-Sumi one owner example, wreath with a fiddle cut headstock with the two lower edges of the fiddle cut brought to a point instead of the usual small flat and no label or serial number. It was (in the owner's words, and I agree) peeling the bark off the trees when I played it (and the tree like was 200 yards away!). I almost bought it too, but he reconsidered the sale and decided to keep it. Wise move on his part. 12 - Archtop, maple, two piece flange, Saga/ presto old style tailpiece. Came in wreath and h&f, 2 w/b/w concentric rings on the resonator. Has been seen with 3 piece neck, rosewood center stripe (#83xxxx, #810367), 10 ply maple pot (#810367). Same hardware, pot as -11 except for possibly the first Sumi ones (?). 20 - 20JD only. J.D. Crowe models, '34 Granada replica, old cutting figured Michigan maple for the necks for the first 80, old growth more recent cutting Michigan maple for some JDC (still great, tight annular rings wood), and old growth Michigan maple veneer for the resonators from the same mill as Gibson bought from in the 30's, signed by JDC. S/N 810041-80 have two labels, one on top of the other: the top one is signed. This group probably started at 810041, 810042 has been verified to have two labels; the first batch was 20 banjos for sure. One piece flange, and the neck is the weird thick profile now called the v-neck like the 9584-x Granadas. $1595 plus $100 for the #2903 Superior Case in 1981, $2695 (case?) in 1986. There is a cover story on the banjos in BNL in October 82. The first series of the J.D. Crowe models (the 3 apparent batches, 20/20/40 totalling 80 instruments in 1981) are the best of the best of the Japanese production banjos, which is why I talk about them. These are 81001 to 810080, there are no 82 or 83 models. The early ones are tobacco colored with a black stained Brazilian rosewood fingerboard like the old Granadas. Later ones are pale yellow and black sunburst like some Gibsons (84xxxx) and then more traditional brown coloring (see above picture) with a date serial number and have an ebony fingerboard. These first 80 were brand new 40 year old RB-Granadas that happened to be built in 1980-81. It took a long time for the first batch of 20 to get here, they were announced at the NAMM show at the Disneyland Hotel (California) in January 1980, they got to the US in June of 1981. Most were sold on the west coast, because of the location of the NAMM show and the dealers who could mere conveniently attend it. Crowe got at least S/N 81001. 85 - RB 75 style mahogany banjo, S/N 810128 has been seen with same pot as one of the second set of JDC's (S/N 810027), one piece flange. I believe the pots were made at the same time by the same maker. Leaves and bows, nominally like Crowe's/ Keldsen's RB75. Non 1981 GF-85 were probably the regular Gold Star pot, but they have a slightly different tone ring that the GF-100 series. -85 had only leaves and bows inlay. The resonator construction is also different compared to the -100. FWIW, the first Bluegrass Band album was recorded with Richard Keldsen's RB75, the one that started the whole Gold Star thing, because Crowe had had the neck broken by airline baggage handlers on HIS RB75, and did not want to fly to San Francisco with it where the album was to be recorded. The second and third were recorded with it also because Tony Rice told Crowe to use it because it sounded so good on the first album. 100 - Standard mahogany nickel plated flathead, one piece flange. 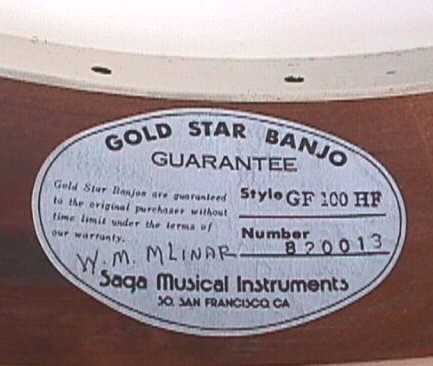 Tom Adams' Gold Star banjo (which he has played for years by choice) is a 1981 GF-100W, s/n 8103xx. He is not a tinkerer either, he has said his banjo setup "stays pretty much the same for years." 200 - Nickel plated flathead, one piece flange, UP Michigan maple, resonator veneer from the same mill Gibson used in the 20's and 30's. Has been seen with a date for a serial number. (85.7.26!) Effectively a nickel plated JD Crowe. HF - hearts and flowers inlay, original with the blank first fret, not like the later fingerboards on Scruggs' Granada.. Earl had the third fret inlay duplicated on the first fret. JD - J.D. Crowe signature model, hearts and flowers only, no inlay on the first fret. Visit Paul's catalogs page, which includes images of two vintage Gold Star catalogs. 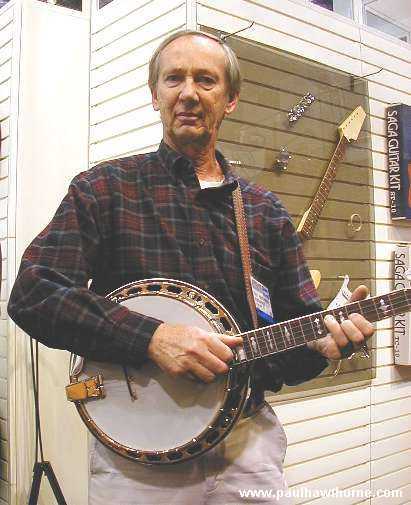 At the Anaheim NAMM trade show in January 2004 the first production unit reissue Gold Star banjo was shown as well as the prototype from the July show and IBMA. Again called GF-85, they are visually, materially and dimentionally similar to the old Gold Star GF-85 and/ or 1930's Gibson RB-75/ RB-3 design that those were cloned from exept there are no rings in the resonator as on the 75. They are mahogany with leaves and bows as inlays, a one piece flange with a Gold Star manufactured 20 hole flat head long skirt cupric alloy tone ring. Here are some pictures of the first one, #0300001 that was flown over for the January trade show in California. 3/4 GF-85 back, GF-85 front. 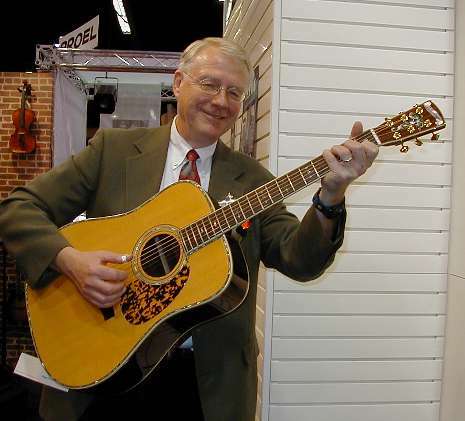 3/4 GF-85 front, yours truly playing the GF-85, and finally the man behind it all with Gold Star and Saga, our benefactor Richard Keldsen, with a stunning Blueridge (Saga) BR280 guitar in solid fiddleback Brazilian rosewood and spruce. These are not the same animal as the typical Korean Masterclone. The Korean made instruments have a certain ambiance and some are good, while some are PR, decoration and hype over performance. These reissue Gold Stars come from an almost clean slate and are made in China on new tooling, with an aim to replicate 30's Gibsons with a few modern touches like a geared 5th. Only the totally satisfactory (Japanese) Presto style tailpiece is tied to prior tooling. Neither are they the same animal as the wonderful Japanese made Gold Stars described above. The Chinese do not have the masterful touch that the guys who made the 70's/ 80's ones had. I have played a number of production items and the parts are good, in the tradition of the old Gold Stars if not as well finished. The neck is excellent. However, based on 8 production instruments I have seen that were all shipped together to a dealer, IMO it is essential that someone with real setup skills go through the instrument. These 8 had QC, setup and shipping damage issues, and sound-wise ranged from dud (1) to joyous (#030079). If you buy one online or by phone from a dealer with no proven in depth setup services without you actually playing it, you are on your own. To repeat again, travel and try, it is the way to assess the dealer's setup. The sound is the proof and reason to purchase, not the average of comments on an internet discussion list. There is a review of the GF-85 in Banjo Newsletter for June 2004. It was done by Mike Kropp, who has a '34 Gibson RB-3 and an '81 Gold Star J.D. Crowe. This puts him in a good position to assess. Here is the essence of the August 2003 faxed Saga product description to the dealers. It is a quoted directly; the italicized text are my comments and additions. I have no more information to offer than is already here on the site, on specification, comparisons to the sound of Tom Adam's Gold Star, etc... what you get here is it. Right handed only - there will not be any in lefty, I asked. Bound mahogany resonator, 13 5/8" diameter, bound top and bottom. This is the genuine narrow edge 30's 13 5/8" Gibson size and shape, but does not have concentric rings like a late '30's RB-75. It is not the 14" (355mm) diameter wide lip one that usually indicates KOREA, as on Morgan Monroe, Samick, Gold Tone, etc.... maple sidewalls, no poplar in the construction. 3 ply maple rim made in Asia - they got it together to the very high Saga standards. 1 piece flange, true to original 1929 (Gibson) subcontractor specifications and blueprint, made on new tooling. It is mounted clear of the resonator. As such, it is not as well finished / detailed as current ones from other sources. The original Gibson one was an economy measure. This is the most accurate replica of a prewar Gibson flange available. I have seen #040197 with the Japanese Saga made one piece flange which had been phased out of production. Apparently it is back in production. It has a much better preparation and plating than the Chinese one. It also has a larger inside diameter and should not be considered as a straight interchange for the Chinese ones which had finish and plating flaws in 03/04. 24 brackets, old Gibson thread (8-26), not the metric thread of the old Gold Stars. 4:1 ratio planetary tuners - modest quality at best.... plan on replacing them. Geared 5th peg - modest quality at best.... plan on replacing it. Mahogany neck - Glued up out of several pieces which is an acceptable way to save raw (rain forest) materials. It plays very well. I believe it is identical in profile to those on Rover banjos. Shop adjusted - what this means is undefined.... based on those examples I have seen and as said above the seller and/ or the customer will have to do a complete set up including addressing tone ring, neck and resonator fit, and another $75-100 or so for top quality tuning machines. Retail US$1395 including Golden Gate CV-1530 case. The CV-1530 wooden case is Asian made green plush and a redline like 20's Gibson issue cases. It is not as protective as the ABS CP1530 case. I suggest demanding the plastic case. At the 2005 NAMM show, the GF-100 was announced. Basically identical to the GF85 except for an ebony fingerboard with a choice of Hearts and Flowers, Flying Eagle or Wreath patterns, one piece neck (with ears glued on?) and 2 concentric rings on the resonator. Retail list price is US$1695. Again, the plastic case is preferable and will need to be demanded. Present delivery is guessed to be in summer of 2005. The fit of the firm foam lining is very close and will not crush out like the padding in many other cases. I'm specifically thinking of Saga Superior and TKL Professional cases. The resonator does not move sideways in the case. It only will accept true Masterclones and similar, like the new GF-85. Oversize pegheads will not fit. Deerings will not fit, the peghead is too wide. This includes Goodtimes with the flyswatter head. I don't know about the Golden Era/ Golden Wreath masterclones. It will not accept 14" (356 mm) (i.e. Korean like Gold Tone, Morgan Monroe, etc.) resonators, only Gibson specification or close with a 13 5/8" (346 mm) diameter. The maximum is 13 3/4" (350mm) which will go and is very snug. A Deering Sierra resonator can be forced in....but the peghead WILL NOT fit. The actual maximum peghead dimensions (normal 22 fret neck with 26.188" scale, 11" pot) are 6 1/2" long, 3 1/4" wide. These are the dimensions of the Gibson double cut peghead, which will touch one side of the case lining and the end of it. Overall banjo length 38" maximum. The case pocket is narrow, spare sets of strings will not fit unbent. I keep them up by the peghead. As with all cases, it is wise to lubricate the hinges (oil) and latch rubbing surfaces (white grease) right away. The hardware will last much longer. There are at least a few (unlisted) lefties, CP-1530L. I wound up with 3 of them. 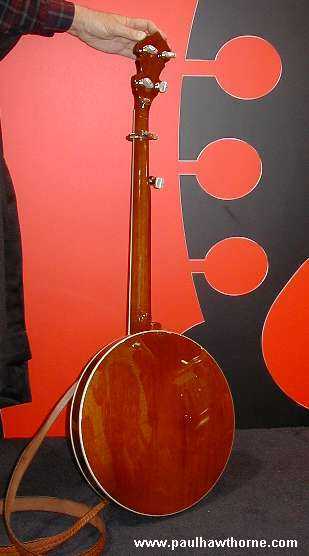 A RH banjo will not fit in the neck notch and have the case close. A LH banjo will not fit in the RH case. Again, the fit is very close and firm. If you have longer than normal tuners on (like Schaller D tuners) you may need to dent the foam where the tuners reach the bottom of the case, otherwise the neck will not rest in the notch. It is difficult to find these cases offered by a brick and mortar store that knows enough to tell you all this stuff up front, or has one so you can find out if your banjo will fit. eBay style retailers are even less likely to know. A few returns because a banjo will not fit, and a merchant could be soured on the case in spite of its attributes. I think this has happened.